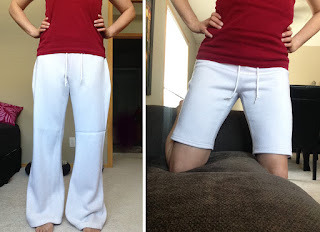 The best part about sewing is being able to get clothes to fit your personal body shape. Too big, too much white, sweat pants. Well fitted, with the perfect splash of white, sweat shorts. I would also like to share an additional sewing project with you ... Eco-Friendly Cleaning Cloths. I decided to make these from a single large yellow towel I had. I liked the color but I had just one and it didn’t fit in with the rest. 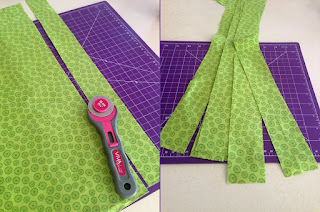 First, I made my own bias tape with some cotton material by cutting it into strips and then pressing the back. Next, I cut my towel into squares. Then, I sewed the bias tape onto the sides of the square cloths to prevent fraying. The shorts look great on you - perfect fit. And "ecofriendly" cloths get a huge thumbs up! Oh so true, one of the many great advantages of sewing is that everything in your wardrobe fits. Too small? Too big? No problem for us! I completely agree. I like the new shorts. Good job.